Product code: ES1335 Categories: Sold Items, Sold Rings. 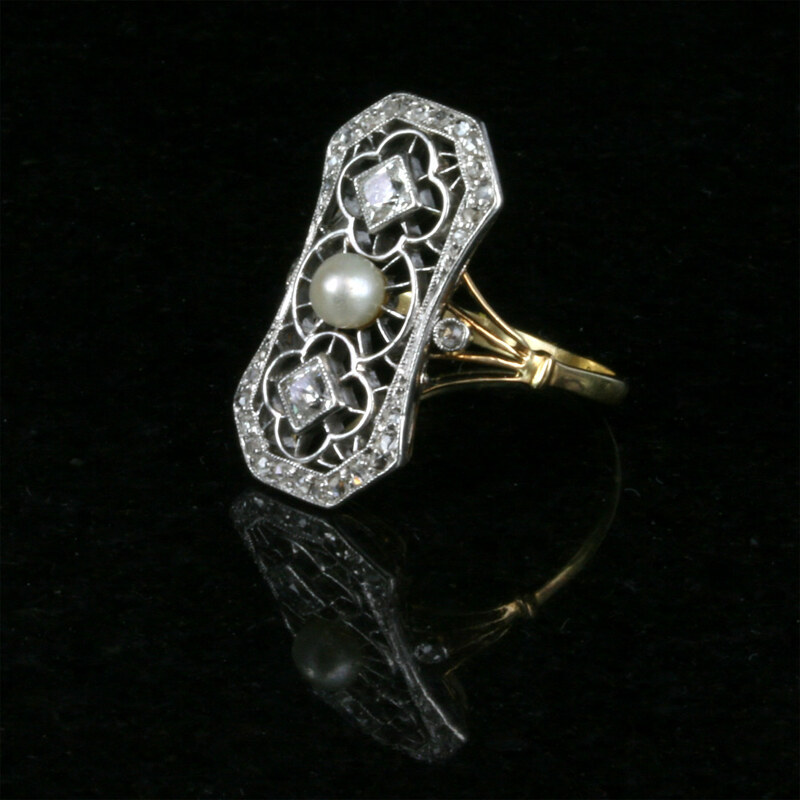 Here is an absolutely stunning platinum and gold diamond and pearl ring from the Art Deco period. Hand made in the 1920’s in 18ct yellow gold and platinum, this ring has the most wonderful and intricate design that looks simply amazing on the finger and shows the ability of platinum to be able to be drawn into a fine wire yet still be strong enough to support the diamonds. Set with 32 diamonds, there are thirty rose cut diamonds that graduate in size so well around the ring and then there are two square cut diamonds that really make such a great feature to this ring as this is not a cut of diamond commonly found. The diamonds total 0.52 carats and highlight the pearl sitting in the centre, this is one Art Deco ring that is simply captivating from all angles. The setting at the top itself is gorgeous as it is not rectangle rather it bends it slightly and so elegantly in the middle giving it a wonderful hourglass figure. Measuring 22.4mm in length by 11.6mm this ring sits so well on the finger and is breathtaking in its design and style. A truly magnificent ring that will always be admired. 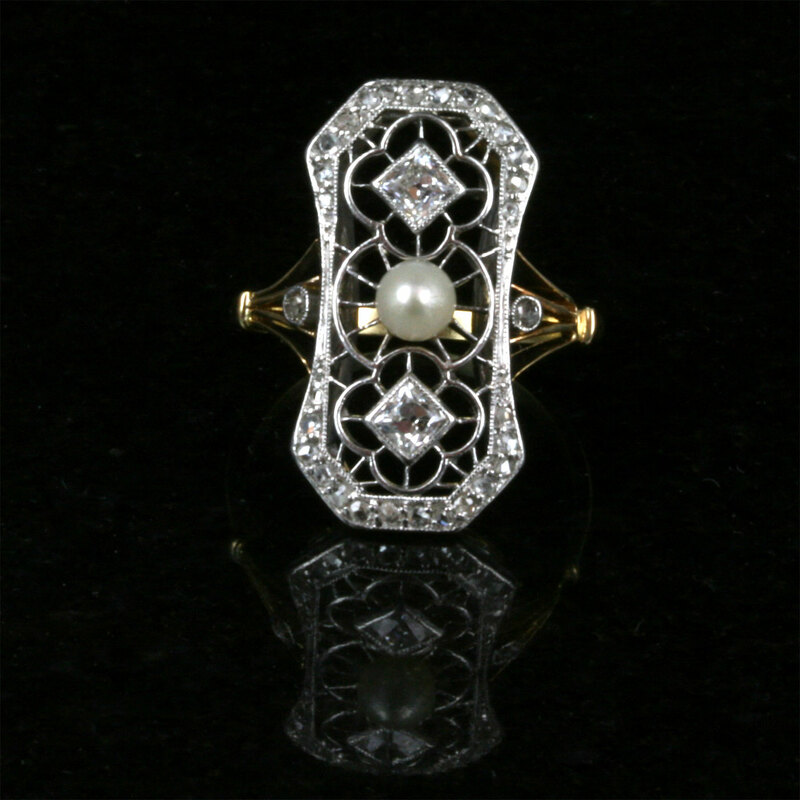 Tag: Art Deco diamond and pearl ring.